The Green Bay Packers' Mason Crosby has a field goal attempt blocked during the second half. The Steelers were called for a batting penalty on the play. GREEN BAY, Wis. (AP) — After an exhilarating win in the snow, Pittsburgh safety Troy Polamalu got even better news when he returned to the locker room. Remarkably, the Steelers are still in the playoff chase. Polamalu’s forced fumble set up Le’Veon Bell’s 1-yard touchdown run with 1:28 left, then Pittsburgh withstood Green Bay’s last throw into the end zone and dealt the Packers’ playoff hopes a blow with a 38-31 victory Sunday. It’s a longshot, but the Steelers (7-8), after starting 0-4 this season, are still mathematically in the hunt for an AFC wild-card spot. They need a lot of help. "It’s been a long road for us, but we still have our struggles. We were one play from losing that game," Polamalu said. It would be a near-miracle if they can get through another week. The Steelers need to beat the Browns in Week 17, and need the Dolphins, Ravens and Chargers — all 8-7 — to lose. "It’s irrelevant, to be honest. Nothing has changed from our standpoint," Polamalu said. "Our mental approach to the game has got to be a week-by-week thing." The loss meant Green Bay (7-7-1) needed Chicago to lose at Philadelphia on Sunday night to stay in playoff contention. "I’m not into drama," coach Mike McCarthy said. "We wanted to control our own destiny, we let that opportunity out of our hands." 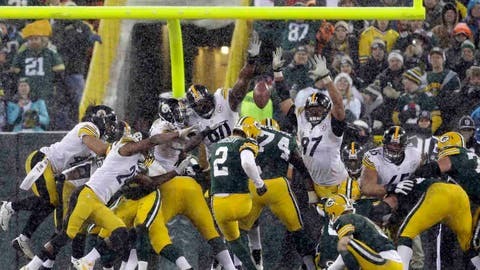 Bell’s TD came soon after scrambling Packers quarterback Matt Flynn fumbled while being tackled by Polamalu. The Steelers recovered at the Packers 17 and scored five plays later, aided in part by an encroachment penalty by the Packers’ Nick Perry, on what would have been a field-goal attempt, to extend the drive. Micah Hyde’s 70-yard kickoff return to the Steelers 31 gave the Packers one last chance. Green Bay got to the 1, but Flynn’s pass to Jarrett Boykin sailed incomplete in the end zone to end the game. Fittingly, the last few seconds were marred by a false start penalty that pushed the Packers back to the 6 and included a 10-second runoff seconds to 10 seconds. The Packers didn’t get the snap off until 3 seconds, and Flynn said it appeared the umpire was holding up the center but started the clock while backing up. "I don’t know what happened, really," Flynn said. "The operation seemed kind of weird right there," Flynn said. Just like the rest of the second half. Steelers cornerback Cortez Allen returned an interception 40 yards for a touchdown and quarterback Ben Roethlisberger dashed through the snow for a 13-yard score in the third quarter. After the Steelers blocked the kick, a scramble ensued and the jostled ball ended up near the sideline, where Steelers defensive lineman Ziggy Hood poked it out of bounds. After conferring for a few minutes, the officials penalized Hood and gave possession to Green Bay, ruling the Steelers never controlled the ball after the block and that it never crossed the line of scrimmage of the Steelers 5. Safety Ryan Clark said he could have picked up the ball, but he was slowed after spraining his ankle in the game and tried to lateral the ball, but it squirted free and eventually got to Hood. "It’s human error in this game," Clark said. "The guy didn’t see it, he didn’t have the opportunity to know if I had possession, so he made the call that he saw and that’s part of football. It’s no big deal, we won." Given another chance, Eddie Lacy barreled into the end zone from 2 yards for a 21-17 lead. Ben Roethlisberger found Matt Spaeth for an 11-yard touchdown pass with 2 minutes left in the third. Fourteen seconds later, Allen had his clutch interception. The Packers roared back with a 22-yard field goal by Mason Crosby before John Kuhn’s 1-yard touchdown run with 7:17 left tied the game at 31. But the Steelers finally finished things off with Bell’s touchdown run and the Packers’ failed last-ditch throw into the end zone. Notes: Bell finished with 26 carries for 124 yards. . . . Lacy had 15 carries for 84 yards and two scores but later left with a sprained ankle. . . . Flynn finished 21 of 39 for 232 yards making his fourth start in place of injured quarterback Aaron Rodgers (left collarbone). . . . Packers LB Clay Matthews left following a sack after re-aggravating a right thumb injury.